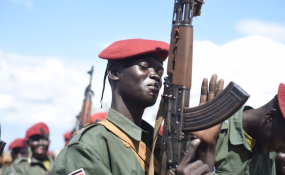 South Sudan the World's Most Fragile State? Khartoum — The Minister of Defence Lt. Gen, Awad Mohamed Ahmed Ibn-Auf, has renewed keenness of Sudan to help realization of peace and stability in South Sudan State, appreciating efforts of IGAD in this regard. This came when he was addressing the opening sitting of the IGAD Chiefs of Staff meeting at Friendship Hall, in presence of Chiefs of Staff of Sudan, Ethiopia, Kenya, Uganda, Djoubuti, Somalia and Rwanad. The Minister of Defence called for adherence to the African Union slogan (African solution for African problems), especially in facing challenges that threaten security of the region and the stability of the people. Ibn-Auf has described the 33rd extraordinary African summit which held in Addis Ababa last September as historic and put the basis for achieving peace in South Sudan. He affirmed the commitment to facilitate all mechanisms and work with all parts to implement meeting's outcome and called on the brothers in South Sudan to work for sustainable peace.